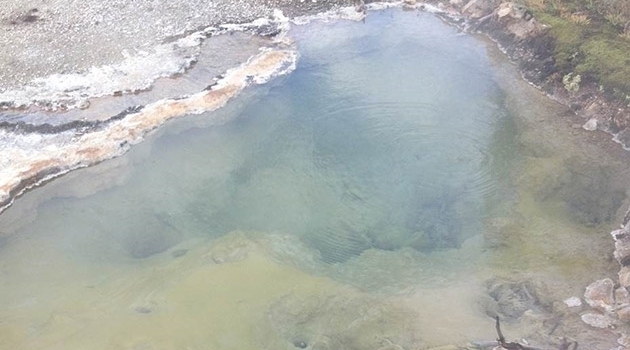 The Yellowstone hot spring that played a central role in the research team's discovery of the new group of microbes called 'Hadesarchaea'. They live several kilometers under the surface of the earth, need no light or oxygen and can only be seen in a microscope. By sequencing genomes of a newly discovered group of microbes, the Hadesarchaea, an international team of researchers have found out how these microorganisms make a living in the deep subsurface biosphere of our planet. Microorganisms that live below the surface of the earth remain one of the last great areas of exploration. Organisms that live there have not been grow in the laboratory and therefore their lifestyles are unknown. An international team led by microbiologists Brett Baker, Assistant Professor at The University of Texas and Thijs Ettema, senior lecturer at Uppsala University, along with scientists from UNC Chapel Hill and the University of Bremen, have discovered how microorganisms, first discovered in a South African gold mine at a depth of two miles, are able to make a living in the absence of oxygen and light. The study is published in Nature Microbiology. Baker and Ettema found these microbes in vastly different aquatic and terrestrial environments; the deep mud of a temperate estuary in North Carolina and underneath hot springs at Yellowstone National Park. 'This new class of microbes are specialized for survival beneath the surface, so we called them “Hadesarchaea”, after the ancient Greek god of the underworld', says Brett Baker, lead author of the study. As its name suggests, the Hadesarchaea belong to a relatively unknown group of microorganisms, the archaea. Like bacteria, archaea are single-celled and microscopically small, but from an evolutionary perspective, they differ more from each other than a human does from a tree. Archaea were discovered only some 40 years ago, by the acclaimed American biologist Carl Woese. To date, archaea remain poorly studied in comparison to bacteria and more complex life forms, such as animals and plants. 'The discovery of the Hadesarchaea will help us increase our understanding of the biology and lifestyle of archaea that thrive in the deep biosphere', says Thijs Ettema. In order to understand these elusive organisms, Baker and Ettema sequenced the genomes of several Hadesarchaea. They were able to determine how these microbes should be classified and what physiologies they use to survive under these extreme conditions. Hadesarchaea have the ability to live in areas devoid of oxygen and the scientists suggest that they are able to survive there by using carbon monoxide to gain energy. Interestingly, the chemical pathways the Hadesarchaea cells use to metabolize carbon monoxide are unique to what has been seen before. 'Before this essentially nothing was known about the Hadesarchaea’s ecological role and what makes them so prominent throughout the world. The new discovery expands our knowledge of how these organisms may have adapted to the extreme conditions of the deep biosphere', says Jimmy Saw, researcher at Uppsala University and co-author of the paper.